Sounds like a country song Ã¢â‚¬â€œ just aboutÃ¢â‚¬Â¦the title describes the short life (thus far) of this new artist. In July I had the privilege to meet Rachel Levitin. My first thoughts: I want to know more about this person and forge a friendship Ã¢â‚¬â€œ she had an energy around her that was bubbly but reserved, there was an underlying current of sadness that didnÃ¢â‚¬â„¢t match with the outside exterior. She was a wealth of information, she followed a different path and yet was blogging as well, so my analytical brain went full throttle. We exchanged contact information (but not business cards Ã¢â‚¬â€œ which I loved). We kept in touch and she invited me to see her play, of all things the Ukulele. 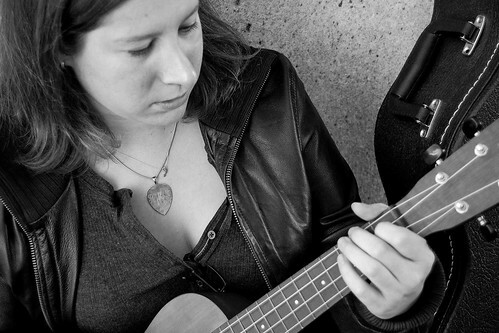 I had never heard of a Ukulele (I played the piano and flute growing up but was otherwise was not musically inclined Ã¢â‚¬â€œ except I loved listening to music Ã¢â‚¬â€œ all kinds Ã¢â‚¬â€œ it always brought true joy to my heart and made a bad day better or a good day great). Unfortunately, a scheduling conflict prevented me from seeing her play but eventually, I would land at Ebenezers Coffeehouse (after driving in circles Ã¢â‚¬â€œ the quintessential lost driver (or out of town visitor) – I assure you I am neither and that it really was the streets. And what I experienced you should treat yourself to. Her music is a combo of folk, rock and blues. She has a voice to compel you to close your eyes and just breathe in the tunes, feel the melody and, if daring enough, sing along or enjoy in silence. The music allows you to relax and take a few moments for yourself. It is music that can play in the background while you and your friends or loved ones play a game of scrabble, sit in front of the cozy fire with a glass of your favorite vino or enjoy a long country ride (by bike, car or horse). It has enough pep to make your most grueling workout better or to encapsulate your day. RachelÃ¢â‚¬â„¢s songs are about her life. Over the last year, the fog around her has lifted. She has emerged from her emotional coma brought on by the death of her dog, her father, maternal grandmother and paternal grandmother in 2009. 12 hours after her dog past away, her father passed away on January 17, 2009; several months later her grandmothers died within two months of each other. 2009 was suppose to be about beginnings, given Rachel had just graduated from college. Instead it was marred by tragedy, a tragedy that has made her stronger, her musical vision stronger, helped define her existence and fueled this new adventure. RachelÃ¢â‚¬â„¢s father was instrumental in her development as an artist. She began writing songs with her Dad at the tender age of 5 and became her own voice at age 12. Her father embraced this talent and taught Rachel how to develop it, introducing her to all aspects of singing, from writing, to producing, to delivering. RachelÃ¢â‚¬â„¢s influences expand the last century from big band jazz to Johnny Lang to Norah Jones to Judy Garland to Barbara Streisand. Rachel describes herself as an old soul. She loves the oldies but embraces the newbies Ã¢â‚¬â€œ she even gets inspiration from “Glee”. She released her first album before leaving high school in 2005, titled Ã¢â‚¬Å“Come As You Are.Ã¢â‚¬Â No pun intended yet it is a bit Nirvanaesk. Her second album was released her junior year of college in 2008 and is titled Ã¢â‚¬Å“Between Timid & Timbuktu.Ã¢â‚¬Â She is currently in production working on her third album, which will include a full band, something not done until now. Her first two albums were all her. This new album will be more rootsy and more rock with lots of layers. Rachel does music her way. Her message to all of those out there Ã¢â‚¬â€œ today is the day to be independent, find your niche and if that is music, then do it your way! To learn more about Rachel Ã¢â‚¬â€œ please visit: rachellevitinmusic.com. You will be able to experience some of her music. To see her live, she has a mini tour scheduled starting Thursday, November 17, 2011 in the Washington DC area. Her first stop: Fireflies Delray Ã¢â‚¬â€œ Alexandria, Va. Ã¢â‚¬â€œ 8p.m. Ã¢â‚¬â€œ with Dan Wolff. She will then hop the Amtrak for a 17 hour trek to Chicago (nothing like simplicity). 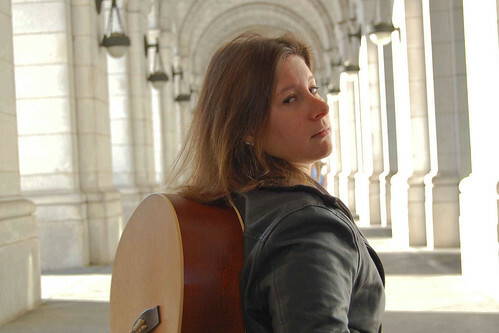 November 20, 2011 Ã¢â‚¬â€œ 2 concerts Ã¢â‚¬â€œ 1st at Michigan City Public Library Ã¢â‚¬â€œ Michigan, IN Ã¢â‚¬â€œ 2p.m. ; 2nd at Uncommon Ground Ã¢â‚¬â€œ Chicago, IL Ã¢â‚¬â€œ 8 p.m. Ã¢â‚¬â€œ with Phil Angotti//$5 suggested donation, Dinner reservations guarantee seating in the music room: (773) 929-3680. November 21, 2011 Ã¢â‚¬â€œ TBA Ã¢â‚¬â€œ Champaign IL and November 25/26, 2011 Ã¢â‚¬â€œ TBA Ã¢â‚¬â€œ Minneapolis/St. Paul, MN. Look for my article on a night of new talent discovered at Ebenezer’s Coffehouse.